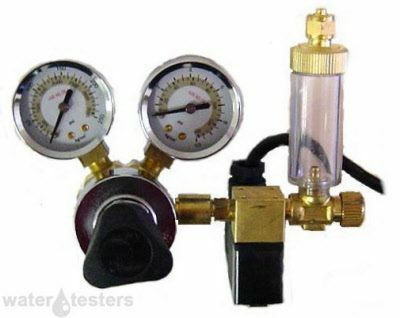 The dual gauge unit comes with an integrated bubble counter for easy viewing of bubbles per second. The MA957 has precision adjusting of CO2 via its integrated needle valve. The Milwaukee MA957 has a solenoid that can be used with an MC122 pH controller for on off cycles once set points are reached, or with a timer. Trust in this unit as it has stood that test of time. Gardening, hydroponic, aquarium use for controlling carbon dioxide release with canisters and tanks. For info on Milwaukee CO2 regulators and other products feel free to email us. See our email @ the Water-testers contact page.